This post is about the alarming rise of online ordering companies hijacking restaurants’ Google Business Profiles. We originally wrote this in January of 2014, but are updating it today (June 22, 2014) because we’ve spotted several more companies hijacking Google profiles. We’ll show you how to spot it, outline the motives, and point out the players behind it. If you work with Eatstreet, Delivery.com, Menufy, Foodler, Beyond Menu, Main Street Hub, Order Hero, or Order Ahead App, I’d definitely read on. What is Google Business Profile Hijacking? This is when somebody modifies your Google Business Profile in an effort to drive traffic to their website and business model. Google maintains a profile for businesses, which includes a link to your website. When people search for you, they list this profile first and link it your website. Hijackers are modifying the restaurant’s Google profiles and pointing them at fake websites with the goal of pushing online ordering so they can build their user base and/or keep a percentage of sales. There are other motives outlined below. It amounts to stealing your natural web traffic and using it for their agenda. The Hijackers do this by filling out some forms in Google that trigger an automated phone call verification process. Google calls your business phone and a computer reads a code. We believe the hijackers are getting permission in the fine print of contracts and then “sweet talking” a hostess into writing down the verification code when they trigger the call. 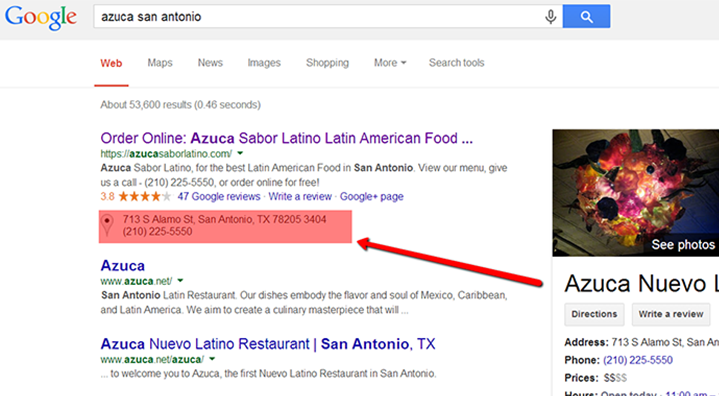 When customers search for a restaurant in Google, they usually enter the restaurant name and city. So, for example, you might enter “Azuca San Antonio”. What shows up first is normally the restaurant’s website connected to their Google profile. If it’s not your URL, then you’ve likely been hijacked. Frequently the only difference will be a .net instead of .com ending. You can spot the site connected to your Google Places profile by looking at the details beneath the website. It will have address info, map marker, reviews, and other Google related features. You can see those highlighted in red below for a typical desktop search. When customers search on mobile phones, the Google Business Profile shows up differently and dominates the results considerably more than just being the top item. So the repercussions are even greater for mobile users. What’s important to note in the screen capture above is that the top site is not Azuca’s website. It links to this website that appears to be owned and operated by EatStreet Acuca’s real website is listed directly below it at www.azuca.net. The repercussions of not having your real website rank first are significant. The first link can receive up to 70% of clicks in search results. These people are seeing the wrong website and EatStreet is getting some serious page views to their online ordering concept. Sometimes the Hijackers make it look like a legitimate website for the restaurant with pages for About Us, Menus, Maps, and other accurate information. But make no mistake, their primary goal is to drive people to order online and generate exposure for Eat Street. This is hurting Azuca’s website traffic and regular dining business. 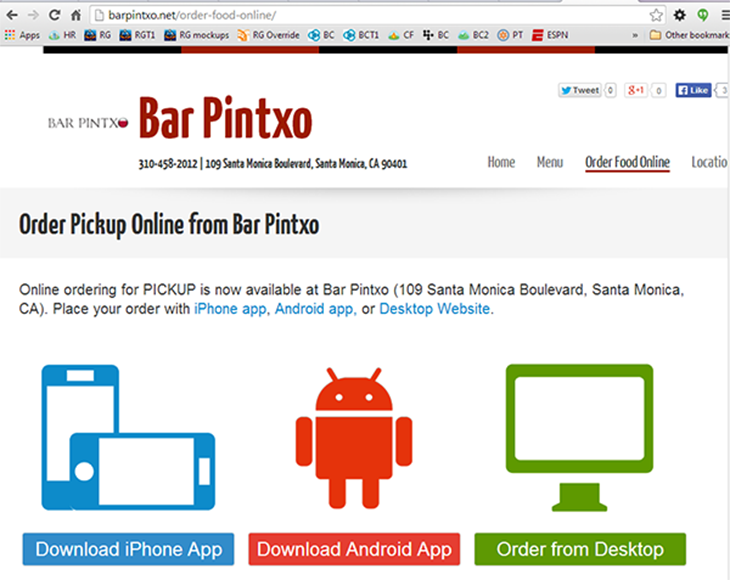 Order Ahead App is well funded and and made a pretty nice site for a client of ours named Bar Pinxto in Santa Monica. It looked totally legit. They pulled Bar Pintxo’s fake site down back in January, but here’s a link to a current site they’ve hijacked. You can see the focus on that site is to order online and/or download the mobile app. But you couldn’t even order at Bar Pinxto…they weren’t even an Order Ahead App customer! The motive there was to simply get users to download their app. Here’s a screen capture of the Call to Action to download the app in the fake Bar Pintxo website. We first noticed this with a client called Ashton’s Alley in NYC. To Main Street Hub’s credit, when we contacted them they said they would remove it. We went ahead and fixed it in Google Places and Ashton’s Alley called them and canceled their package. Ashton’s Alley actually signed up for Main Street Hub’s service that was designed to build their social media presence. One of the ways they accomplished that goal was by hijacking their Google Places profile and pointing it at a Main Street Hub version of their website that focused on getting people to like Ashton’s Alley on Facebook and follow them on Twitter. These are decent objectives, but not at the expense of your website. Ashton’s Alley didn’t realize the repercussions. Their reservations per month dropped by 60%. We saw a drop in Ashton’s Alley’s reservation traffic and went to see if we could figure out what happened as part of our reservation audit process. That’s how we discovered our Main Street Hub had hijacked their Google Profile. Google “Mai Thai Austin” to see this one in action. Menufy’s goals appear the same as the other online ordering companies above. Google “Obao NYC Midtown” to see another delivery company hijacking. Google “Nirvana NYC” to see yet another. Will Google Fix the Source of the Problem? We listed the culprits above so Google might be able to wrap their heads around the motive and do some double checking when they see a delivery company claiming a Google Profie. We’re currently waiting on a response from their “legal team” about a method to fix it for Chutney’s Queen Anne. Back in January, you could reclaim your listing and go through the verification process again and Google usually updated it. But now it appears you can’t claim your listing twice. So once the hijacker does it, it’s labeled as “verified” and there’s no way to get ownership other than requesting the hijacker give it back. So far that’s not working for most cases. Google needs a secondary way to verify ownership above and beyond an automated phone call with a code that is easy to acquire simply by asking the hostess. They need a way to reclaim it when it’s disputed or at least default to domain that looks more legit. We’ve spoken with our clients and none of them were aware of what was done exactly or the negative repercussions. If you’ve got a hijacked site, please send us an email and we’ll let you know if and when Google comes up with a solution. You can also comment below with examples, ideas, etc.